This 420-foot icebreaker is a maze of spaces! I was awakened by the incessant buzz of my cell phone, which was greedily slurping up all the e-mails I had accumulated over the last few weeks. Although I was groggy, it occurred to me that I must be in cell phone range! I looked out my porthole, and gazed upon the unassuming skyline of Barrow, Alaska. After sleeping a bit longer, I called my lovely wife Jan to see how things were going — and to hear her familiar voice. Of course, I woke her up too, but she didn’t seem to mind. I’ll never forget the first time I set foot on the Healy. It was last fall and the ship was in dry dock in Seattle. Part of our ICESCAPE planning meeting included a tour of the ship and so a few scientists, NASA officials, and Healy crew jumped into vans and drove the mile or so from the Coast Guard base to the dock where the ship was being worked on. Now, I had worked on the R/V Nathaniel B. Palmer a few times, an icebreaker used by the National Science foundation for their Antarctic operations. At 310 feet long, it’s an impressive ship. But that experience did not prepare me for the 420-foot behemoth that is the Healy! We had to climb a dizzying gangway to get on the ship and within 30 seconds of entering the first door, I was completely lost. My first thought was “It’s going to take me two weeks just to find my way around this thing!” With its numerous stairwells and long twisting and turning passageways, I getting a sense of what it might be like to live inside of an ant hill. 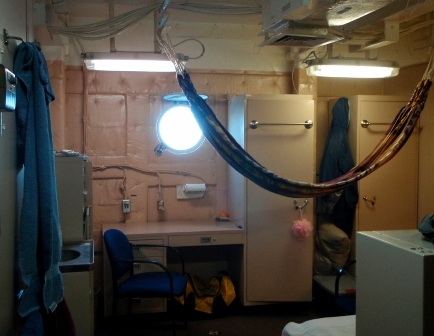 Surprisingly, though, within a day or so of boarding the ship for ICESCAPE, I could pretty much get to most places I needed to go without making any wrong turns, including my room, the mess hall (where we eat), and the labs. It took a few days more to find the helicopter hanger, Aft Con (where they run the winches), and Aloft Con (three decks above the bridge— where they drive the boat when in heavy ice). Two weeks in, I found the laundry. Life on the Healy is surprisingly comfortable. The ship is so large and so well engineered that rough seas are not a big problem— except for a few with sensitive stomachs. We get fed in the mess hall three times a day— four if you opt for 11 pm mid-rats (rats is short for rations)— and the food is pretty good. 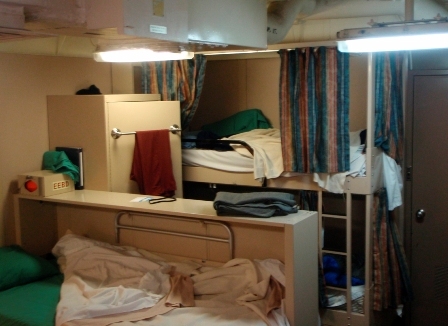 The rooms are quite big for a ship, even if you have a couple of roommates. Everyone has their own bed, desk, and cabinet for their clothes. Each pair of rooms shares one bathroom complete with toilet (called a “head”) and shower, which might be a bit tight for some, although I haven’t heard any complaints. You won’t see much color, though. Virtually everything is painted a light khaki. Walls, ceilings, doors, furniture— even exposed screws, pipes, and wires. It looks very military but you get used to it. As scientists, most of our day is spent in the labs, and there are a number of them on the Healy. The Main lab is by far the largest and where most of the scientists and much of the analytical equipment is located. A few scientists have set up shop in the smaller Wet lab and one research group is housed in the Biochem lab. The Future lab has a few computers for general use and lots of space for people to set up their own laptop workstations. When we’re not working, some people go to the Science Conference Lounge to surf the web, check e-mail, play cards, or watch television (Armed Forces Network). Others prefer to hang out on the bridge or on one of the many decks and take in all of the beautiful scenery. Keeping morale up is an important goal on board the Healy and so there are lots of scheduled events for both scientists and crew to look forward to. Last week we had a rousing ceremony to acknowledge those who crossed the Arctic Circle for the first time (yup, I was one of them). We just finished our World Cup Soccer pool, which our resident NASA journalist, Kathryn Hansen, won under a cloud of controversy. The mustache-growing contest is in full swing— mine’s looking a little thin — and gray. The 3-on-3 basketball tournament resumes tonight. And we begin the ping-pong and foosball tournaments in the next few days. And if that isn’t enough, Saturday nights are for both Bingo in the mess hall and a movie in the Helo Hangar. Although days on the Healy are long, they are never boring. 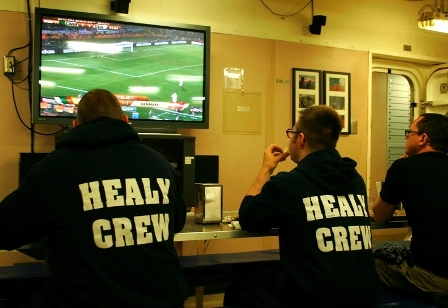 Finally, no description of life on the Healy would be complete without acknowledging its wonderful crew. They are a part of everything we do and without their much-appreciated efforts on the scientists’ behalf, life on board the Healy would be dreary, and more difficult, indeed. Thanks for demystifying what life is like on the Healy! My kindergarten students would have loved to see the bathroom-that’s priority in a 5 year olds mind! Thanks for the great writing!! Glad you FINALLY listened to your wife. :) One of the best blogs you have done! Really enjoyed reading it. You have a new calling, you know. Writing. Love you! Well put!! Its great to hear a civilian’s perspective of life on board ship. My boyfriend isn’t as elaborate since he has to live on there! !